IMAGINE BEING a large mammal confined to an area of just 10 sq km. Imagine surviving genetic experiments, floods, encroachments, diseases and poachers, and that too in a wetland slowly shrinking in size. Imagine being honoured as a state animal, with festivals, newspapers and even TV channels named after you. And suddenly you find there are barely 200 of your kind left, amidst plans to take away the only habitat that nourished and protected you. This is the story of Sangai, a critically endangered brow-antlered deer found in Manipur in a tiny speck of land, mostly grasslands locally called phumdi that float on water. South of Loktak Lake (a Ramsar site) in Moirang district lies the only known sanctuary for this deer, the Keibul Lamjao National Park (KLNP). While the world’s only floating national park is spread over 40 sq km, the Sangai territory is restricted to only about 10 sq km, and it shrinks even further during the monsoon as water levels rise. According to the principal chief conservator of forests, Bala Prasad, the 2013 census revealed that only 24 Sangais were added to the population since 2003, with the total adding up to 204. However, wildlife experts contest these numbers, even as the International Union for Conservation of Nature (IUCN) has put this deer under the red list of critically endangered species. During 1970s-80s, census was conducted using mostly aerial surveys, while later surveys were ground-based. Political turmoil in the region and unstable habitats (shrinking of the floating phumdis) made it impossible to count their numbers. Ace wildlife conservationist, M K Ranjitsinh, also the chairperson of the Wildlife Trust of India (WTI), says, “It is better to assume a far lesser number as census is not conducted every year in a systematic way. “ He was speaking at the Institute of Bioresources and Sustainable Development, Imphal. Kh Shamungao, a retired professor of Zoology and member of Manipur’s State Board for Wildlife, Biodiversity Strategies and Action Plan, says many of the Sangais presumed to exist are likely to be multiple counts of a small number, or excess counts along with certain hog deer. “A complex interplay of several factors in the field can result in the failure of the census method, usually leading to an over estimation,” adds Shamungao. With about 200 Sangais spread across zoos in Delhi, Alipore and Guwahati and breeding centres in Manipur, experts say that lack of genetic diversity is largely contributing to the slow growth of the population. The first pair of Sangai was “gifted” to Alipore Zoo in Kolkata in 1956, the same year when KeibulLamjao was accorded a “national park” status. According to Ranjitsinh, four deer were captured in 1960s after the first survey in KLNP. In 1987, a total of 12 births were recorded which roughly makes it about 1.2 births a year. Currently, the National Zoological Park, Delhi, and the Assam State Zoo, Guwahati, maintain the highest stock of captive Sangais, housing 58 and 30 respectively. Shamungao shows a trend in which captive population of the Sangai in all Indian zoos appears to increase exponentially till the 1980s, and after that their numbers begin to fall. He ascribes two reasons for this. “First, overcrowding the animals with low sanitation in the enclosures and, secondly, a possible genetic disorder or deterioration due to long inbreeding with a small population,” says Shamungao. Ranjitsinh corroborates this finding and says that some species of Sangai may have got mixed with other deer species. Similarly, vertebrae ecologist and scientist with the Wildlife Institute of India (WII), A J T Johnsingh, points out that animals for reintroduction should come only from the wild populations in KLNP, as the animals in captivity have reduced genetic diversity. The wild ill-effects of inbreeding can further cause the population of an animal to shrink. That’s why only 24 new Sangais were born during the last decade, according to the forest department’s census. “The slow rate of population growth, high rate of infant mortality and decreased survival are the manifestation of genetic disorders. The inbreeding is commonly associated with a lowering of viability, adaptability and birth weight-a phenomenon known as inbreeding depression,” says Shamungao. The habitat of the Sangai is already under stress. In 1983, the Manipur government built a barrage for a multipurpose power project on the confluence of the Imphal river, Khuga river and its tributary, the Ungamel channel, south of Loktak Lake. To maintain the water and the power supply, the authorities raised the water height at the reservoir to 762.12 m. A study on Loktaklake by non-profit Kalpavriksh found that KLNP suffered extensively as a result of the raised water level-the park area was constantly inundated by frequent flash floods, especially during the monsoon. The study adds that the backflow effect of the Khuga river through the Ungamel channel towards the south of KLNP causes a sudden water rise in the river during monsoon which hits the national park with great force. As a result, the floating biomass or phumdi gets ripped apart and the loose vegetation drifts away. “This not only reduces the vegetation cover in KLNP, but also endangers the wildlife inhabiting the park. It has been reported that wildlife like wild boar, hog deer and Sangai had strayed out of the park area on this drifting biomass. Poachers take advantage of such situations to capture the wildlife,” states the author of the study, Salam Rajesh. These findings are backed by new research. A recent report by WII researchers, Chongpi Tuboi, Syed Ainul Hussain and Ruchi Badola, reveals that KLNP is facing a phumdi-degeneration rate of nine per cent every year. The researchers have measured maximum thickness of phumdi at 163 cm and the least at 47.44 cm. At the rate of nine per cent, the maximum thickness will be 63.48 cm and minimum at 18.47 cm in 10 years. Hussain says that the construction of the Ithai Barrage is choking the natural process of rejuvenating the floating biomass on which the Sangais thrive. “Park waters remain stagnant due to the barrage which causes pollution in the area as soluble oxygen decreases, affecting fish populations. The untreated municipal sewage generated from Imphal city flows into the Imphalriver,” adds Prasad. Imphal generates about 4.9 million tonnes of solid waste and 2,121 cubic metre of sewage annually, which directly flows into Loktak through the Imphal and Nambul rivers. Shamungao, who has studied the impacts of the barrage on the Sangai, says inundation of phumdi impacts the rutting activities of the Sangai, which is crucial for breeding. He adds that water quality in the core area of the national park has deteriorated leading to a pH level of 3.5 (Central Pollution Control Board guidelines prescribe a pH level between 5 and 6) (see ‘The making of phumdi’). 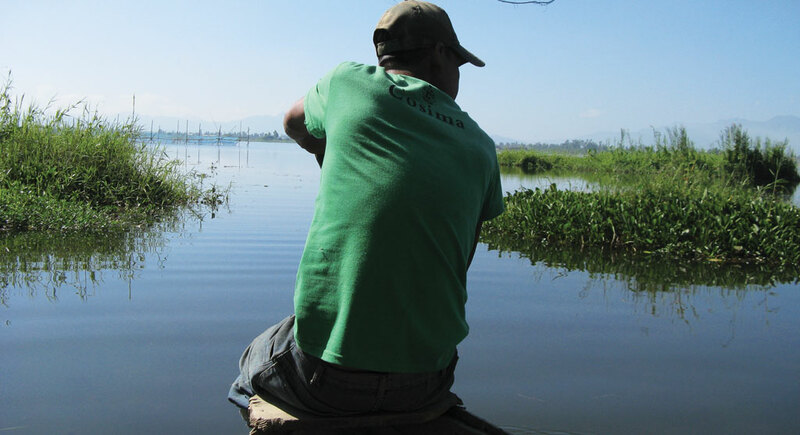 In November 2011, the Loktak Development Authority, a government body for conserving the lake, removed encroachments from 70 sq km of the lake area. This led to the displacement of about 5,000 persons, mostly fishing communities. Forest officials say many of those displaced have moved south towards KLNP in search of livelihood. Grazing of cattle by 2,000 agrarian families living around the national park area, too, leads to forage loss for the Sangai. A large number of people still venture inside the park to collect various herbs and edible plants which are nutritious even for the Sangai. A socio-economic study by WII researcher Ruchi Badola shows the willingness of the residents in partnering with the government to conserve the Sangai and the park as a whole. “Most showed their willingness to work for tourism or handloom development as an alternative instead of collecting edible plants or fishing in the area,” she says. While wildlife conservationists are making efforts to save the Sangai’s habitat, forest officials are now planning a separate habitat in a 60-sq km area in Pumlen Pat Lake, west of the Manipur river to relocate the Sangai. It is now only a matter of a few months before the government finally approves the relocation. According to a forest official, though Pumlen Pat is close to KLNP, it is a degraded ecosystem, where the phumdis are very thin. “Sangai has thrived in the floating sanctuary of KLNP, which is still a great source of nourishment for these animals. We do not know if they will survive in a new habitat,” says Ranjitsinh. Dinabandhu Sahoo, director, Institute of Bioresources & Sustainable Development, Imphal, says everything in Manipur runs in the name of Sangai. If the Sangai is lost, how will Manipur justify its culture? Sangai is called the dancing deer. However, it is not the Sangai that dances, but the peculiar nature of its habitat that lends this trait. While treading through phumdi (grasslands that float on water), the Sangai's hooves sink in the spongy, moist ground which from a distance looks as if it is dancing. 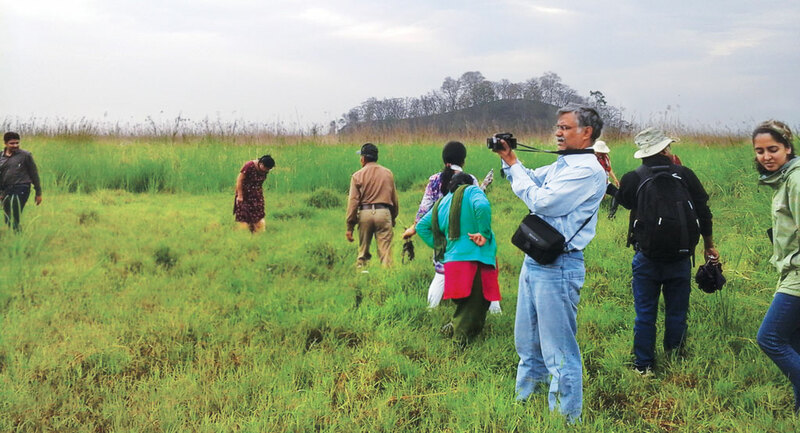 According to Kh Shamungao, a retired professor of zoology and adviser to the Manipur State Board for Wildlife, the phumdi plays an important role in the ecological processes and functions of Loktak Lake, the habitat of the Sangai. "They support the rich biodiversity and govern the water quality and nutrient dynamics of the lake," he writes in Endangered Manipur Brow Antlered Deer: An Environmental Assessment. The high proportion of humus matter in the phumdi gives it a low specific gravity and high buoyancy, causing it to float in a loose formation. The floating mass continues to accumulate more soil particles and humus which accelerates the growth of the plants. Depending on the composition of the plants, an 80-100 cm thick phumdi can hold the weight of an adult Sangai and a human being. A large patch of phumdi, 20 m long, 10 m broad and 2 m thick can easily support one small hut with four to five persons. During the dry months, the phumdi can settle at the bottom, and the rootlets of the vegetation can draw nutrients from the soil layer. Even during these months it retains its swampy nature.